What’s So Great About Gardening? I’ve been doing a lot of “F-ing” around lately. I’ve been Feeling with a capital F and you all know how I feel about that. I’ve been Feeling frustrated, as if I am in free-fall. I am failing and flailing. When I admitted my feelings to my genius-friend Steph, she promptly pooh-poohed them. While I may feel fallow, in her opinion, I am actually flourishing. For weeks now, she said, I’ve been glowing; she said I must be growing. She said something BIG is happening. Nothing is happening; that’s the problem. Apparently God agrees with Steph, because the Universe keeps sending me invitations to see this time of my life in a positive way, but it is sooo hard to do. I see the invitations to be patient, to trust and to wait. I say yes to them on one level, but my ego wants no part of this patience party. My ego wants results. And so I keep feeling the way I do, and the Universe keeps inviting me to feel differently. My dear Aunt Beth posts a lot of things on Facebook. Some are profound, some sweet, some silly. I put this one in the silly category, but it turns out that was a bit hasty. Seeing it for the first time, I didn’t think twice. Walking recently, I saw this image for what it was – another invitation. I want to be the rabbit on the right. I want to have something big and green and leafy in my hand. I am supposed to be building a brand, making a name for myself, getting “gigs” as a writer and speaker. I do what I can to make that happen and then I breathe and I pray. I write and teach, mother and wife, love and laugh and mourn. All these actions are good and necessary, but in the eyes of the world (and I guess my own too much of the time), they don’t amount to much. They aren’t producing the kind of “greens” I’d like to see. 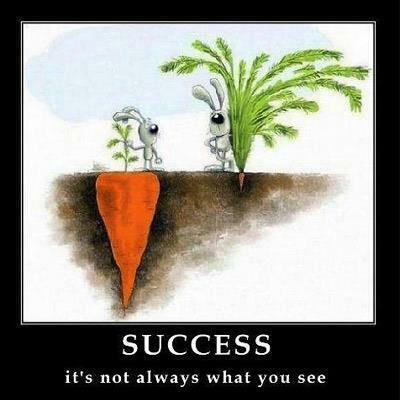 In contrast, God is inviting me to see myself as the rabbit on the left, the one standing by the shabby, little sprouts. The invitation is to be patient. The invitation is to trust that something good is growing. It may be buried deep; it may be under a lot of manure. But that something, whatever it is, is worth waiting for. The rabbit on the left will be much happier in the long run, if she doesn’t give up and abandon her garden. Sometimes, for this rabbit, that feels like a big if. Sometimes, this rabbit thinks she should get a job at McDonalds. In case you haven’t guessed, I am a terrible gardener. I have little patience for seeds and the nurturing they require. I only plant flowers in full bloom and when they die, it’s at least a year, or two before I can muster up the energy to replace them. Perhaps that is exactly what this season of my life is here to teach me: to be a good gardener of my soul. The seeds of our dreams were planted deep in our hearts in childhood. They began with gifts we were given and were shaped by the experiences we lived. They were nurtured by love, or warped by indifference, ridicule, or fear. But eventually, given time and even a ray of sunlight, those dreams begin to grow. For some of us, the harvest may come early; for others, it may come very, very late, if at all. I imagine the fruit of our labor may not even be what we thought we were growing all those years. In my case, I hope it will be even sweeter for the surprise.